Principle 1: Every company should be headed by an effective Board to lead and control the company. The Board is collectively responsible for the long-term success of the company. The Board works with the Management to achieve this objective and the Management remains accountable to the Board. The primary role of the Board is to protect and enhance long-term value and returns for the shareholders. The Board approves the Group’s strategic plans, key business initiatives, major investments and funding decisions, and ensures the business affairs of the Group are effectively managed and conducted by an executive management (the “Management”). (i) considering sustainability issues, including environmental and social factors, in the formulation of the Company’s strategies. Each individual Director has objectively discharged his duties and responsibilities at all times as fiduciaries in the interests of the Company. Directors who are in any way, directly or indirectly, interested in a transaction or proposed transaction have to declare the nature of their interests in accordance with the provisions of the Companies Act, Chapter 50 of Singapore (the “Companies Act”). (d) policies and procedures, delegation of authority matrix, code of conduct and business ethic. All relevant information on material events and transactions are circulated to the Directors as and when they arise. To facilitate effective management and without abdicating the Board’s responsibility, certain functions of the Board have been delegated to various Board committees (“Board Committees”). The Board is assisted by an Audit Committee (“AC”) as well as a Remuneration and Nominating Committee (“RNC”), each of which functions are clearly defined in their respective terms of reference and operating procedures which are reviewed by the Board on a regular basis. 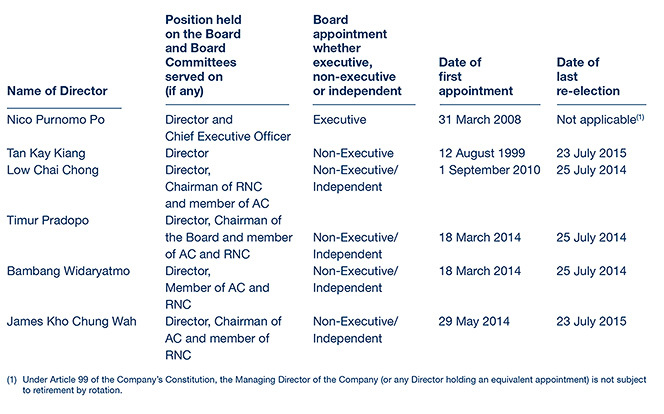 The RNC and AC comprise Non-Executive Directors, all of whom including the Chairman, are independent. The Board meets on a half-yearly basis to review the financial performance of the Group and approve the release of the Group’s half year and full year financial results. Additional meetings of the Board may be held as and when circumstances require. The Constitution(1) of the Company (the “Constitution”) allows meetings of the Board and Board Committees to be conducted by way of teleconference and videoconference. The Directors normally set dates of the meetings of the Board and Board Committees well in advance. The Management will organise orientation programmes for new Directors to familiarise them with the Group’s operations and business issues as well as the relevant regulations and governance requirements. The Company provides ongoing education to the Directors on Board processes, corporate governance practices and updates on changes to laws and regulations. The Directors are also encouraged to keep themselves abreast of latest developments relevant to the Company or themselves. Where necessary, the Directors will be updated on new legislations and/or regulations and changing commercial risks, from time to time, which are relevant to the Group. News releases issued by the Singapore Exchange Securities Trading Limited (“SGX-ST”) and Accounting and Corporate Regulatory Authority which are relevant to the Directors are circulated to the Board. The Directors are kept informed of upcoming conferences and seminars relevant to their roles as Directors of the Company. Such conferences and seminars as well as other training courses will be arranged and funded by the Company for all Directors. Annually, the external auditors will update the AC and the Board on any new and revised financial reporting standards which are relevant to the Group. Newly appointed Directors will be issued a formal letter by the Company Secretary explaining their duties and obligations as a Director upon their appointment. Principle 2: There should be a strong and independent element on the Board, which is able to exercise objective judgement on corporate affairs independently, in particular, from Management and 10% shareholders. No individual or small group of individuals should be allowed to dominate the Board’s decision making. The profiles and key information of the individual Directors as well as their respective shareholdings in the Company are set out in the “Board of Directors” and “Directors’ Statement” sections of this annual report respectively. There is presently a strong and independent element on the Board, with Independent Directors constituting more than half of the Board, which is in line with the Code. The independence of the Directors is reviewed annually by the RNC. The RNC adopts the Code’s definition as to what constitutes an Independent Director in its review. In addition, each Independent Director is required to complete a Director’s Independence Checklist annually to confirm his independence based on the guidelines as set out in the Code. Taking into consideration the RNC’s review, the Board is of the view that Mr Low Chai Chong, Mr Timur Pradopo, Mr Bambang Widaryatmo and Mr James Kho Chung Wah are independent. None of the Independent Directors has served on the Board beyond nine (9) years from the date of his appointment. The size and composition of the Board is reviewed on an annual basis by the RNC to ensure that the Board has the appropriate mix of expertise and experience, and collectively possesses the necessary core competencies for effective functioning and informed decision-making. When a vacancy arises under any circumstances, or where it is considered that the Board would benefit from the services of a new Director with particular skills, the RNC, in consultation with the Board, determines the selection criteria and selects candidates with the appropriate expertise and experience for the position. The RNC then nominates the most suitable candidate for appointment by the Board to the Company. The Board and the RNC have considered and are satisfied that the current size of the Board of six (6) Directors is appropriate taking into consideration the existing nature and scope of the operations of the Group. The Board and the RNC are also satisfied that the current Board as a group has core competencies in accounting and finance, business and management experience, industry knowledge, strategic planning experience and customerbased experience or knowledge. The Non-Executive Directors provide, amongst other things, strategic guidelines to the Company based on their professional knowledge and experience. They constructively challenge and help develop directions on strategy and review the performance of the Management in achieving agreed targets and objectives. To facilitate a more effective check on the Management, the Non-Executive Directors are encouraged to arrange for meetings without the Management being present at times deemed necessary. In general, the Board is able to exercise objective judgment independently from the Management and no individual or small group of individuals dominates the decision-making of the Board. Principle 3: There should be a clear division of responsibilities between the leadership of the Board and the executives responsible for managing the company’s business. No one individual should represent a considerable concentration of power. There is a clear division of roles and responsibilities between the Non-Executive Chairman, Mr Timur Pradopo, and the Chief Executive Officer (“CEO”), Dr Nico Purnomo Po. The Non-Executive Chairman leads and manages the business of the Board whilst the CEO and his team of management staff translate the Board’s decisions into executive action. The separation of the roles and responsibilities of the Chairman and the CEO ensures an appropriate balance of power, increased accountability and greater capacity of the Board for independent decision-making. The Non-Executive Chairman is not related to the CEO. (h) continuous pursuance of high standards of corporate governance. The CEO is responsible for implementing the Group’s strategies and policies, making strategic and business investment decisions as well as the overall management and performance of the Group. The Board is of the opinion that there is a balance of power and authority within the Board. As recommended by the Code, the Board has appointed Mr Low Chai Chong, an Independent Director, as the Lead Independent Director. Mr Low Chai Chong chairs the RNC and is also a member of the AC. Mr Low Chai Chong is available to shareholders when they have concerns which contact through the normal channels has failed to resolve, or for which such contact is inappropriate. Led by the Lead Independent Director, the Independent Directors will meet, where necessary, without the presence of the other Directors and the Lead Independent Director will provide feedback to the Chairman and the CEO after such meetings as appropriate. The RNC was formed in June 2003 by the merger of the Nominating Committee and the Remuneration Committee of the Company. Currently, the RNC comprises four (4) Non-Executive Directors, all of whom including the Chairman of the RNC are independent. The Chairman of the RNC is not a substantial shareholder of the Company or directly associated with any substantial shareholder of the Company. (c) the Board shall within three (3) months of cessation of a member appoint a new member from the date of cessation so that the number of members of the Board does not fall below three (3) if a member, for any reason, ceases to be a member. (j) recommend the appropriate training and professional development programmes for the Board. The RNC’s role in respect of remuneration matters is separately disclosed under Principle 7 (Procedures for Developing Remuneration Policies). The RNC is charged with determining the independence of the Directors as set out under Guildeline 2.3 of the Code. The RNC conducts an annual review of the Directors’ independence and is of the view that Mr Low Chai Chong, Mr Timur Pradopo, Mr Bambang Widaryatmo and Mr James Kho Chung Wah are independent. Currently, none of the Directors hold excessive number of board representations. Nonetheless, the Board has set the maximum number of listed company board representations each Director may hold to be eight (8). When a Director has multiple board representations, the RNC also considers whether or not the Director is able to and has adequately carried out his duties as a Director of the Company. The RNC is satisfied that sufficient time and attention has been given by the Directors to the affairs of the Company, notwithstanding that some of the Directors have multiple board representations. The Company has only one alternate Director. Mr Tan Nan Choon, who is the alternate Director to Mr Tan Kay Kiang, is also the nephew of Mr Tan Kay Kiang and he attends all meetings of the Board. (b) extensive experience and business contacts in the industry in which the Group operates. The proposed candidates’ independence (if necessary) will also be considered before the RNC makes its recommendations to the Board. The new Directors will then be appointed by the Board The RNC is in charge of nominating the Directors for re-appointment, having regard to their contribution and performance, including but not limited to attendance, preparedness and participation. Under the Company’s Constitution, at least one-third of the Directors for the time being shall retire from office by rotation at each annual general meeting (“AGM”) of the Company, provided all Directors except the Managing Director (or any Director holding an equivalent appointment) shall retire by rotation at least once every three (3) years. The CEO shall not be subject to retirement by rotation nor be taken into account in determining the number of Directors to retire. or re-nomination as a Director. Principle 5: There should be a formal annual assessment of the effectiveness of the Board as a whole and its Board Committees and the contribution by each director to the effectiveness of the Board. The RNC has implemented a formal review process to assess the effectiveness of the Board and the individual Director’s performance on an annual basis. All members of the Board are required to complete and send the evaluation forms to an independent coordinator (the “Independent Coordinator”) directly and in confidence within four (4) weeks after the end of each financial year. The Independent Coordinator will then collate the results and forward them to all members of the RNC for discussion. The RNC will thereafter report its findings to the Board. For the purpose of its evaluation of the Directors’ performance, the RNC focuses on whether the Directors, individually or collectively, possess the background, experience, competencies in finance and management skills critical to the Group’s business as well as whether each Director, with his special contributions, brings to the Board an independent and objective perspective to enable sound, balanced and well considered decisions to be made. Factors taken into account in the assessment of a Director’s performance include his abilities and competencies, his objectivity and the level of participation at Board and Board Committee meetings including his contribution to Board processes as well as the business strategies and performance of the Group. Principle 6: In order to fulfil their responsibilities, directors should be provided with complete, adequate and timely information prior to board meetings and on an on-going basis so as to enable them to make informed decisions to discharge their duties and responsibilities. The Board, its committees and every Director have separate and independent access to the Management and are entitled to request for additional information as needed to make informed decisions. To ensure that the Board is able to fulfill its responsibilities, the Management provides the Board with a management report containing complete, adequate and timely information prior to Board meetings as well as a report of the Group’s ongoing activities. In addition to the business plans submitted to the Board for approval, the Board was provided with management reports, board papers and related materials in respect of the Company’s performance, position and prospects as and when requested. The Management will also keep the Board apprised of material variances between the actual results, corresponding period of last financial year and the budget with appropriate explanation on such variances. In addition, all Directors have separate and independent access to the Company Secretary. The Company Secretary attends all meetings of the Board and Board Committees and prepares minutes of meetings of the Board and of the Board Committees which are circulated for review. The Company Secretary is also responsible for ensuring that Board procedures and all other rules and regulations applicable to the Company are followed and advises the Board of the requirements of the Company’s Articles of Association, the Companies Act (Chapter 50) and the Singapore Exchange Trading Securities Limited (“SGX-ST”) Listing Manual Section B: Rules of Catalist (the “Catalist Rules”). The appointment and removal of the Company Secretary is a matter for the Board to decide as a whole. The Directors may seek independent professional advice as and when necessary in furtherance of their duties. The appointment of such professional advisors is subject to approval by the Board. Any cost of obtaining such professional advice will be borne by the Company. Principle 7: There should be a formal and transparent procedure for developing policy on executive remuneration and for fixing the remuneration packages of individual directors. No director should be involved in deciding his own remuneration. The members of the RNC are disclosed under Principle 4 (Board Membership). (d) recommend to the Board in consultation with the key management and the CEO, any long-term incentive scheme. The RNC is tasked to provide a formal, transparent and objective procedure for fixing the remuneration packages of individual Directors and to ensure that the level of remuneration paid by the Company serves to attract, retain and motivate the employees needed to manage the Company successfully. All aspects of remuneration, including but not limited to Directors’ fees, salaries, allowances, bonuses and other benefits-in-kind shall be covered by the RNC. The recommendations made by the RNC will be submitted for endorsement by the Board. Each member of the RNC shall abstain from voting on any resolutions in respect of his remuneration package. The RNC has access to professional advice from experts outside the Company on remuneration matters as and when necessary. The RNC will ensure that existing relationships between the Company and its appointed remuneration consultants, if any, will not affect the independence and objectivity of the remuneration consultants. The Company will also disclose the names and firms of the remuneration consultants (if any) in the annual remuneration report, and include a statement on whether the remuneration consultants have any such relationships with the Company. The Company did not engage any remuneration consultant in respect of the remuneration matters of the Group during FY2016. In the case of service contracts, the RNC will consider what compensation commitments the Directors’ or key management personnel’s contracts of service, if any, would entail in the event of termination with a view to ensure that such contracts of service, if any, contain fair and reasonable termination clauses which are not overly generous. Principle 8: The level and structure of remuneration should be aligned with the long-term interest and risk policies of the Company, and should be appropriate to attract, retain and motivate (a) the directors to provide good stewardship of the company, and (b) key management personnel to successfully manage the Company. However, companies should avoid paying more than is necessary for this purpose. The Group sets remuneration packages which are competitive and sufficient to attract, retain and motivate Directors and key management with adequate experience and expertise to manage the business and operations of the Group. In setting remuneration packages, the Group takes into account salary and employment conditions withinthe same industry and in comparable companies. The Group adopts a remuneration policy for the Executive Director, comprising a basic salary component as well as a bonus component, which is performance-based and seeks to align the interests of the executive Director with those of the shareholders of the Group. Currently, the Company does not have any long-term incentive scheme. The RNC will consider recommending the implementation of incentive schemes for the executive and non-executive directors as well as key management personnel as and when it considers appropriate. All Directors are paid Directors’ fees, determined by the Board based on the effort, time spent and responsibilities of the Directors. The payment of such fees to the Directors is subject to approval of the shareholders at each AGM of the Company. The Independent Directors have not been over-compensated to the extent that their independence is compromised. Non-executive Directors have no service contracts with the Company. The executive Director has a service contract with the Company, which can be terminated by either the Company or the executive Director giving not less than three (3) months’ notice in writing. The Company does not use contractual provisions to allow the Company to reclaim incentive components of remuneration from the executive Directors and key management in exceptional circumstances of misstatement of financial results, or of misconduct resulting in financial loss to the Company. Principle 9: Each company should provide clear disclosure of its remuneration policies, level and mix of remuneration, and the procedure for setting remuneration, in the company’s annual report. It should provide disclosure in relation to its remuneration policies to enable investors to understand the link between remuneration paid to directors and key management personnel, and performance. There were no termination, retirement and post-employment benefits granted to the Directors and key management personnel (who are not Directors or the CEO). After due consideration, the Board has decided not to disclose the remuneration of the individual Directors in full and the aggregate total remuneration paid to the key management personnel (who are not Directors or the CEO) due to the competitive pressures and disadvantages that may result from such disclosure as well as for confidentiality reasons. 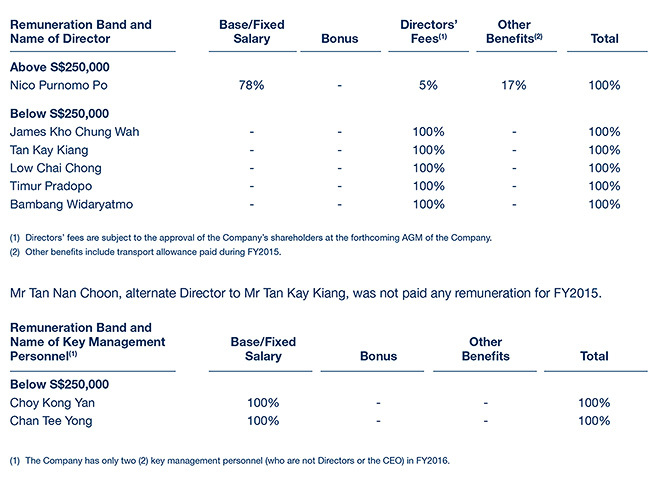 The Company does not have any employee who is an immediate family member of any Director or the CEO, and whose remuneration exceeds S$50,000 during FY2016. Currently, the Company does not have any share-based compensation scheme or any long-term incentive scheme involving the offer of shares or options in place. The Group sets remuneration packages which are competitive and sufficient to attract, retain and motivate Directors and key management personnel with adequate experience and expertise to manage the business and operations of the Group. In setting remuneration packages, the Group takes into account salary and employment conditions within the same industry and in comparable companies. The Group adopts a remuneration policy for the Executive Director, comprising a basic salary component as well as a bonus component, which is performance-based and seeks to align the interests of the Executive Director with those of the shareholders of the Company. Principle 10: The Board should present a balanced and understandable assessment of the company’s performance, position and prospects. The Board endeavors to ensure that the annual audited financial statements and half yearly announcements of the Group’s financial results present a balanced and understandable assessment of the Group’s performance, position and prospects. The Board embraces openness and transparency in the conduct of the Company’s affairs, whilst preserving the commercial interests of the Company. Financial and other price sensitive information are disseminated to shareholders through announcements and press releases via SGXNET on a timely basis. The Board takes adequate steps to ensure compliance with the relevant legislative and regulatory requirements and observes obligations of continuing disclosure under the Catalist Rules. During FY2016, the Board has reviewed reports submitted by the Management to ensure compliance with all the Group’s policies, operational practices and procedures and relevant legislative and regulatory requirements. In line with the Catalist Rules, the Board has also provided a negative assurance statement to shareholders in respect of the half yearly results announcement. The Management also regularly provides the Board with appropriate detailed management accounts of the Group’s performance, position and prospects to enable the Board to make a balanced and informed assessment of the Group’s financial position, performance and prospects. Principle 11: The Board is responsible for the governa1nce of risk. The Board should ensure that Management maintains a sound system of risk management and internal controls to safeguard shareholders’ interests and the company’s assets, and should determine the nature and extent of the significant risks which Board is willing to take in achieving its strategic objectives. The Group is subject to various laws and regulations in all of the jurisdictions in which it operates, including those relating to property development. Changes or concessions required by regulatory authorities could also involve significant costs and delay or prevent completion of the construction or opening of a project or could result in the loss of an existing license. The Group’s and the Company’s exposure to interest rate risk arises primarily from the loans and borrowings. Investment in high value properties such as those in which the Group has invested or intend to invest, are relatively illiquid. Such illiquidity may affect the Group’s ability to vary its investment portfolio or liquidate part of its assets in response to changes in the economy, changes to the real estate market or other conditions. In 2013, the Company, together with the internal auditors, has formalised the Group’s Risk Management Policies and Procedures to facilitate the Board in identifying key operational, strategic, financial, compliance and information technology risks with reference to the Company’s business goals, strategies and corporate philosophy. With the formalisation of the Group’s Risk Management Policies and Procedures, the internal auditors had assisted the Company in the execution of the risk management processes and discussed with the key management personnel on the same. In the process, the Company’s risk tolerance levels have been established and adopted, and the Board has overseen the Management in the design, implementation and monitoring of the risk management and internal control systems. The internal auditors had also evaluated the effectiveness of the internal controls implemented to manage the identified risks based on the results of the risk assessment process executed. The effectiveness of the internal financial control systems and procedures are monitored by the Management. The Board acknowledges that it is responsible for the overall internal control framework, but recognises that no cost effective internal control system will preclude all errors and irregularities, as a system is designed to manage rather than eliminate the risk of failure to achieve business objectives, and can provide only reasonable and not absolute assurance against material misstatement or loss. (d) the review of significant issues raised by the external and internal auditors. Based on the framework of risk management and internal controls established and maintained by the Group, the review performed by the Management and the AC, the work performed by the internal auditors and the review undertaken by the external auditors as part of their statutory audit, the Board, with the concurrence of the AC, is of the opinion that the Group’s internal controls, including financial, operational and compliance controls, and risk management systems, are adequate to meet the needs of the Group in its current business environment. (b) the Group’s risk management and internal control systems were effective. Principle 12: The Board should establish an Audit Committee (“AC”) with written terms of reference which clearly set out its authority and duties. Currently, the AC comprises four (4) Non-Executive Directors, all of whom including the Chairman of the AC are independent. The Chairman of the AC is not a substantial shareholder of the Company or directly associated with any substantial shareholder of the Company. The members of the AC have many years of experience in senior management positions in both financial and industrial sectors. The Board is of the opinion that the members of the AC are appropriately qualified to discharge their responsibilities. The AC has explicit authority to investigate any matter within its terms of reference, full access to and co-operation from the Management as well as full discretion to invite any Director or executive officer of the Group to attend its meetings, and is given reasonable resources to enable it to discharge its functions properly. (m) review and report to the Board at least annually the adequacy and effectiveness of the Company’s internal controls, including financial, operational, compliance and information technology controls (such review can be carried out internally or with the assistance of any competent third parties). In additional to the activities undertaken to fulfil its responsibilities, the AC is kept abreast by the Management, external and internal auditors on changes to accounting standards, stock exchange rules and other codes and regulations which could have an impact on the Group’s business and financial statements. The AC has met the external auditors and the internal auditors, without the presence of the Management, for FY2016. were no non-audit services rendered by the external auditors to the Group. The AC has reviewed and confirmed the independence and objectivity of the external auditors. As such, the AC has recommended to the Board that Ernst & Young LLP be nominated for re-appointment as external auditors of the Company at the forthcoming AGM of the Company. The Company has complied with Rules 712 and 715 of the Catalist Rules in relation to the appointment of auditing firms for the Group. No former partner or director of the Company’s existing auditing firm or audit corporation is a member of the AC. The Board undertakes to investigate complaints of suspected fraud in an objective manner and has put in place a whistle-blowing policy and procedures which provide employees with well-defined and accessible channels within the Group including a direct channel to the AC, for reporting suspected fraud, corruption, dishonest practices or other similar matters. The policy aims to encourage the reporting of such matters in good faith, with the confidence that employees making such reports will be treated fairly and, to the extent possible, be protected from reprisal. On an ongoing basis, the whistle-blowing policy is covered during staff training as part of the Group’s efforts to promote fraud control awareness. The policy and its effectiveness will be reviewed by the AC periodically, with recommendations regarding updates or amendments, if any, to be made to the Board as required. There was no whistle-blowing report received during FY2016. Principle 13: The Company should establish an effective internal audit function that is adequately resourced and independent of the activities it audits. The AC’s responsibilities over the Group’s internal controls and risk management are complemented by the work of the internal auditors. The size of the operations of the Group does not warrant the Group having an in-house internal audit function. The Company has outsourced its internal audit function to an external professional firm to perform the review and test of controls of the Group’s processes in FY2016. The AC approves any hiring, removal, evaluation and remuneration of the external professional firm to which the internal audit function is outsourced. The AC has reviewed and assessed the qualifications and experience of the appointed internal audit firm’s team which undertakes the function of its internal audit within the Group. The internal auditors report primarily to the Chairman of the AC. The internal auditors plan their internal audit schedules in consultation with, but independent of, the Management. The internal auditors have unrestricted access to all the Company’s documents, records, properties and personnel, including access to the AC. The AC has reviewed the scope and findings of the internal audit performed by the internal auditors during FY2016 and the Management’s responses thereto. The AC is satisfied that the internal audit function is adequately staffed with suitably qualified and experienced professionals with the relevant experience. The internal auditors are guided by the Standards for the Professional Practice of Internal Auditing set by The Institute of Internal Auditors. The AC will assess and ensure the adequacy and effectiveness of the internal audit function annually. Principle 14: Companies should treat all shareholders fairly and equitably, and should recognize, protect and facilitate the exercise of shareholders’ rights, and continually review and update such governance arrangements. interests. The Board’s policy is that all shareholders should be equally informed on a timely basis of all major developments that impact the Group. Price sensitive information, results and annual reports of the Company are released via SGXNET. A copy of the annual report, together with the notice of AGM, is sent to every shareholder. Such notice is also advertised in a daily newspaper. All shareholders are entitled to attend the Company’s general meetings and are provided the opportunity to participate in the general meetings. Shareholders are also briefed by the Company on the rules, including voting procedures that govern general meetings. These general meetings also provide excellent opportunities for the Company to obtain shareholders’ views on value creation. Shareholders (other than a shareholder who is a relevant intermediary) may vote in person or by appointing up to two (2) proxies to attend and vote on their behalf at the general meetings of the Company. A shareholder who is a relevant intermediary is entitled to appoint more than two (2) proxies to attend and vote at the general meetings of the Company. The duly completed proxy form is to be deposited at the Company’s registered office 48 hours before the time of the general meetings. Principle 15: Companies should actively engage their shareholders and put in place an investor relations policy to promote regular, effective and fair communication with shareholders. The Company is committed to corporate governance and transparency by disclosing to its stakeholders, including its shareholders, as much relevant information as is possible, in a timely, fair and transparent manner as well as to hearing its shareholders’ views and addressing their concerns. The Company does not practice selective disclosure of material information. All material information on the performance and development of the Group and of the Company is disclosed in an accurate and comprehensive manner through SGXNET and the Company’s website. General meetings have been and are still the principal forum for dialogue with shareholders. They offer opportunities for Board to interact with shareholders, understand their views, gather feedback as well as address concerns. Enquiries by shareholders are dealt with as promptly as practicably possible. Currently, the Company does not have a fixed divided policy. The Board would consider establishing a dividend policy at the appropriate time. In considering the payment of dividend, the Board shall consider factors such as the Company’s profits, cash flows, working capital and capital expenditure requirements, investment plans and other factors that the Board may deem appropriate. Taking into consideration these factors, the Company has not declared any dividends for FY2016. Principle 16: Companies should encourage greater shareholder participation at general meetings of shareholders, and allow shareholders the opportunity to communicate their views on various matters affecting the company. The shareholders are encouraged to attend the general meetings to communicate their views on matters affecting the Group and to stay informed of the Group’s strategies and visions. The Company’s Constitution does not allow shareholders to vote in absentia. The Company is not implementing absentia voting methods such as voting via mail, e-mail or fax until security, integrity and other pertinent issues are satisfactorily resolved. Substantially separate issues are tabled in separate resolutions at general meetings. Voting is carried out systemically, and the votes casted and resolutions passed are properly recorded. All Board members, including the Chairman of the AC and the RNC, and the external auditors are normally available at general meetings of the Company to answer questions from the shareholders. Registered shareholders are invite to attend and participate actively in such meetings. The Company Secretary prepares minutes of general meetings, which incorporates substantial comments or queries from shareholders and responses from the Board and the Management (if any). These minutes will be made available to shareholders upon request. The Company conducts the voting of all its resolutions by poll at all its general meetings. The results of poll of each resolutions tabled are announced at the meetings and in an announcement released after the meeting via SGXNET. Shareholders can vote in person or by their appointed proxies. The Company will employ electronic polling if necessary. The Company has issued a guideline on share dealings to all Directors and employees of the Group which sets out the code of conduct on transactions in the Company’s shares by these persons, the implications of insider trading and general guidance on the prohibition against such dealings. In line with Rule 1204(19) of the Catalist Rules, the Company issues a notification to all Directors and officers of the Group informing them that they are not allowed to deal in the securities of the Company during the periods commencing one month before the announcement of the Company’s half-year or full-year financial results until after the announcement of the relevant results. In addition, the Company prohibits all Directors and officers of the Group from dealing in the Company’s shares on short-term consideration or when they are in possession of unpublished price-sensitive information. 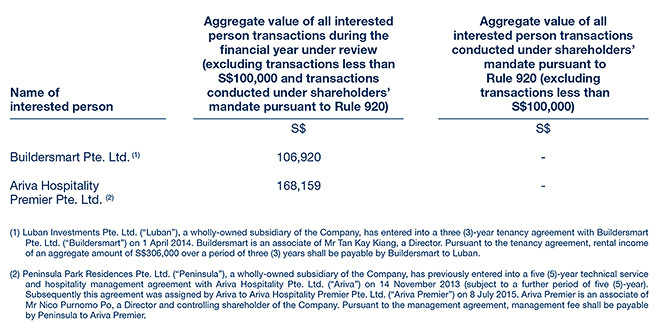 (a) As at the end of FY2016, there was an outstanding loan amount of S$28,981,202 due to Pollux Treasures Pte. Ltd., a company wholly-owned by Pollux Botero Pte. Ltd. (a 50:50 joint venture with Goldman Morgan Holdings Pte. Ltd., a company wholly-owned by Mr Nico Purnomo Po (Director and CEO of the Company)), from the Company and Goldman Morgan Holdings Pte. Ltd.. This loan is unsecured and interest-free, and is repayable on demand. With reference to Rule 1204(21) of the Catalist Rules, there was no non-sponsor fee paid to the Company’s sponsor, Canaccord Genuity Singapore Pte. Ltd., for FY2016.